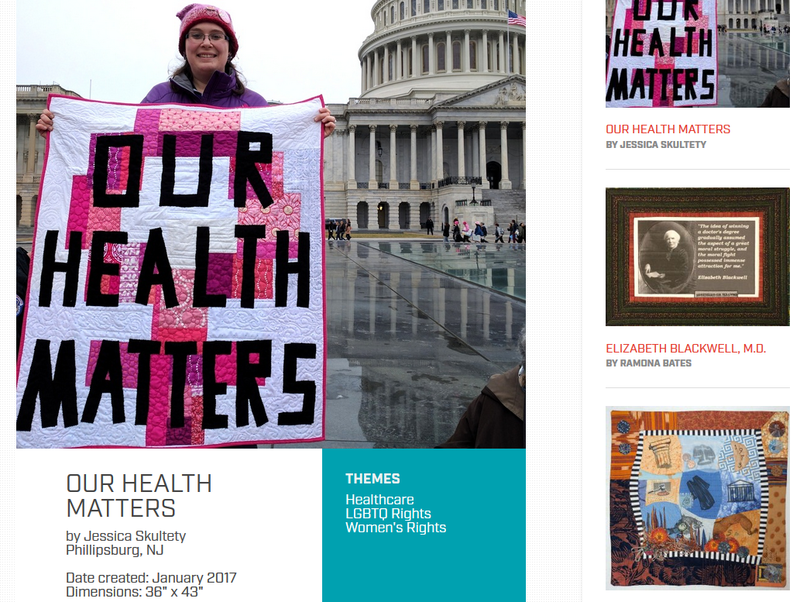 Today I'd like to introduce a new website, United We Quilt, which was designed as an empowering, positive outlet for quilters to share their quilts in response to the new U.S. administration. I'll be back later this week to share a special finished quilt. Many quilters and artists around the world make art inspired by the world around them. For me, making "statement"/political quilts is a cathartic practice. One goal of this new site, United We Quilt, is to group together and show quilts to a wider audience. Eleanor Levie, the founder, asked if she could feature my "Hear Our Voice" quilt on the site. After I responded with appreciation for her mission, Eleanor asked if I'd be willing to help manage the site. Related: recently, at a sewing night, I was talking with some of my quilting friends about visual representations of history. When people look back on a time period, they often note objects of cultural importance - especially art. So, when I look back on this time in American history (and when my kids, and their kids, and THEIR kids look back), I want to remember that there were others like me, who made art about the things they believe in - and that they shared them. And maybe I helped that happen. So I said "yes" to Eleanor. The site just opened up and we hope it will continue to grow. Read more about the site here, submit work here (it's free, and you can submit past work that applies), and view the current gallery of work here. Another related note: the exhibit deadline for Threads of Resistance, a physical show of similar themes that will travel the U.S., is May 1. Thanks for sharing this Jessica. It being Canada's 150th anniversary has gotten me thinking along these lines as well. Thanks Lisa! It's great to be a part of something bigger than yourself. I hope in at least helping on the sidelines I'll be contributing to something meaningful. I use my quilting time as meditative and a personal quiet time where I can pray about things that need attention. I really don't want any political ideations or politics in my "quilting zone." I am unhappy with the people who are paid an enormous amount from our tax dollars who are elected to represent the "people" in their district, but instead of working, they just waste time obstructing and remind me so very much of the crowd described in the gospels, "crucify him", instead of actually working for that salary and pension, and healthcare that is not under the AHA. I am ashamed so many are doing nothing positive for our people, our country, but slander and incite violence and hatred for the President. I'm glad that you value your quilting time in that way, because quilting can be peaceful and meditative for all of us. You can certainly choose to shut out politics from your quilting sphere if you'd like. I'm glad to live in a free country where I can make art that means something to me and to others, and feel free to share it no matter if people like it or not. Best of wishes to you on this new quilty endeavor, Jess! This sounds awesome. Off to check it out now!